In case you didn’t notice, “Laura Loomer” hit the #1 trending position on Twitter on Thursday, even though the independent Jewish conservative journalist was permanently banned from Twitter last week. The reason for her sudden spike in notoriety? She handcuffed herself to the doors of Twitter’s headquarters in New York City and vowed to stay indefinitely, and even to pee her pants if necessary. So far, Twitter’s reaction has been brilliant, albeit unsatisfying to those of us who sympathize with her cause: they simply called her bluff. Meh. Stay handcuffed there if you want, lady. It’s gonna be chilly tonight. Loomer first burst onto the social media journalism scene in October 2017 thanks to her relentless coverage of the Las Vegas shooting and the seemingly opaque and slapdash investigation by law enforcement. Since then, she’s made a name for herself among conservatives with her in-your-face style of reporting and commentary. Just last month, Loomer confronted #MeToo icon Alyssa Milano over her support of and association with notorious anti-semite Linda Sarsour. Since then, Milano has distanced herself from Sarsour. Isn’t it ironic how the twitter moment used to celebrate “women, LGBTQ, and minorities” is a picture of Ilhan Omar? Ilhan is pro Sharia Ilhan is pro- FGM Under Sharia, homosexuals are oppressed &amp; killed. Women are abused &amp; forced to wear the hijab. Ilhan is anti Jewish. In fairness, reading Loomer’s tweet does make me want to suspend her temporarily for high crimes against grammar, or at least send her a copy of Lynne Truss’ Eats, Shoots & Leaves. But that wasn’t the reason Twitter cited in its email to Loomer informing her of her suspension and subsequent ban. Instead, Twitter whipped out the tried-and-true “hateful conduct” language of its Terms of Service and accused Loomer of violating the rules. And maybe she did; “maybe” being the operative word here. That’s precisely what’s so infuriating about Twitter. Jack Dorsey and his team of militant SJW thought police have intentionally defined a vague, completely subjective “hateful conduct” policy that they can selectively interpret in order to silence those people whom they deem heretical and dangerous to their Orwellian agenda. If Loomer’s tweet is a violation of Twitter’s policy, then there are countless examples of even more egregious violations that Twitter conveniently ignores, even from blue check-marked, verified accounts. Tweets like “God, I hate white people” (Mike Drucker) and “yes I am racist! I hate white people!” (Andy Cohen). Advocating for violence against white people even comes with a few popular hash tags, including #KillWhites and #KillAllWhitePeople. Not to mention the over 12,000 tweets in February of 2017 that called for Trump’s assassination. Twitter conveniently ignores tweets like these — tweets that fit within their SJW ideology — and when users flag them as inappropriate, Twitter inexplicably concludes that this time, the “hateful conduct” clause doesn’t apply because, well, um…reasons. During her protest, Loomer highlighted Twitter’s blatant dishonesty and gross bias by displaying a large poster of a tweet from Nation of Islam leader Louis Farrakhan in which he referred to Jews as “termites.” Farrakhan’s account is still active, of course, because the “hateful conduct” clause is the ultimate scam. It’s not meant to be used against “hateful conduct” at all, but as a cherry-picking tool to silence enemies of the radical Marxist ideologues operating behind the scenes at the subversive tech giant. This is obvious to anyone with two or more connected neurons, and it’s why — if you are a principled advocate for the freedom of speech — you should fully support Laura Loomer’s grandstanding. Twitter summarizes its supposed values in a single sentence: “We believe in free expression and think every voice has the power to impact the world.” Free expression, huh? Shareholders, directors, employees, and customers need to heed Laura Loomer’s dramatic message: Twitter is one big, fat, lie — and a dangerous one at that. This brings us to the moment of the story in which principled advocates of individual rights sigh in disappointment and secretly start wishing that the batteries in Laura’s megaphone would die. If only Twitter had decided to press charges. Damn, you, Jack! Can’t you do anything right? It’s pathetic how many conservatives pretend to be principled right up until the moment that shiny ring of State power is within their meaty grasp. It’s like they can smell the testosterone of jack-booted thugs kicking down Twitter’s doors and it gets them all worked-up into a sexual frenzy: they immediately start fantasizing about how they’d use all that power for good. “Principles are great and all, but in this case…” There’s always a “but.” There’s always some caveat or exception when conservatives think there’s an opportunity to force people to behave the way they want them to. This is not the appropriate context in which to explain why being principled is practical, so instead I’ll focus on presenting three practical reasons why it’s a horrible, horrible, horrible idea to ask the government to get involved in Twitter’s business, even if Twitter is run by a bunch of sniveling cheats. First of all, government regulation removes pressure from Twitter and support for alternatives. Whether or not Twitter will reform itself, advocates for free speech need people to be angry at Twitter. If Twitter eventually caves to pressure from free speech advocates and behaves responsibly, great. If it doesn’t, then that opens up the door for competition. Patience is required here. Successful competition doesn’t happen overnight, but if Twitter continues to serve Emperor Palpatine, the groundswell of pent-up anger and frustration is what will be needed to fuel a Rebel Alliance in the form of a viable alternative. If Twitter is forced to comply with a set of Federal guidelines, people will perceive that the problem has been “solved” and all that righteous anger will dissipate. Meanwhile, Twitter will be doing the same thing every large, regulated company does: it will try to appear as compliant as possible when the regulators are looking, but as soon as their backs are turned it’ll be implementing its own agenda anyway, probably in the most obfuscated fashion possible. No one likes a busy body standing over them telling them what to do, even people who vote for more government busy bodies. Twitter employees will simply become better at stealthy, underground resistance. Second, government regulation is an enormous barrier to competition. Let’s be honest, here: ideally, Twitter would go bankrupt, all the bloated SJW executives would be scouring Craigslist for fry cook positions, and all the shareholders would take their money and invest it in a more honorable company run by people who actually support free speech. But any such honorable company usually begins with three poor dudes in a garage sucking down an unhealthy amount of Red Bulls (which, by the way, is anything more than zero Red Bulls). Regulations are anathema to startups. Complying with regulations is expensive, and often requires teams of lawyers. Excluding law firms, startups that need a bunch of lawyers usually fail because money that should be spent building a product and attracting customers is instead spent filling out government paperwork, building stupid compliance tools, and cozying-up to nosy regulators. Not to mention that new ideas often don’t fit well within the existing regulatory framework, which means more paperwork and compliance work-arounds and chats with clueless regulators. Finally, even if Laura Loomer’s dreams came true and Donald Trump himself rode Chariot-1 into Twitter’s New York headquarters armed with all the Congressional approvals and Executive Orders that Pinochet himself could hope for; even if Jack Dorsey wrapped himself in a hair shirt and wept in pitiful remorse at Trump’s feet, promising to never ban another conservative ever; even if Twitter became a conservative Shangri-La with blue check marks for every #MAGA supporter and a public apology to Milo Yiannoppoulos permanently pinned to Twitter’s profile page, it would all backfire spectacularly. Soon enough, Laura Loomer would find herself handcuffed to some other door, her throat dry, her bladder full, and her voice hoarse from hours of angry protest alone in the cold. Only this time, no one will be listening. You see, eventually Donald Trump won’t be President. At some point in the future, someone like Beto O’Rourke or Elizabeth Warren or Alexandria Ocasio-Cortez, or even Ilhan Omar will be president, and at some point the Democrats will regain the Senate. And none of those people will give the ring of power back. None of them will say, “never mind about those silly Twitter regulations.” Instead, they’ll redefine words like “hate,” “oppression,” “threat,” “speech,” “civility,” and “terror,” and conservatives will be praying to return to the good ol’ days of unregulated social media. 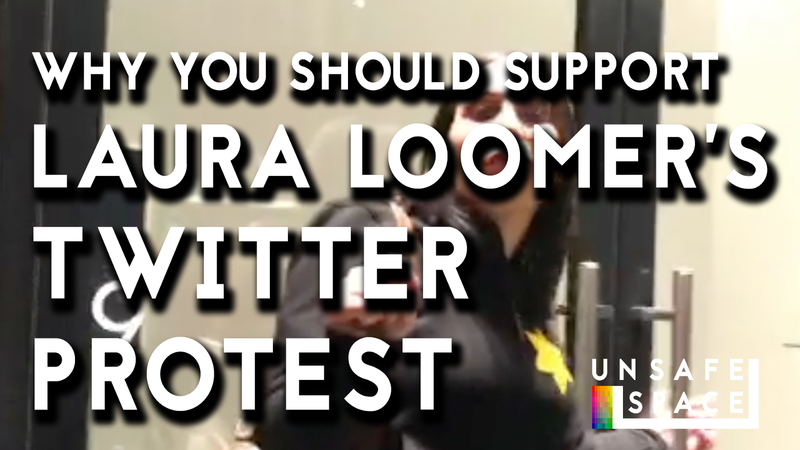 So go ahead and support Laura Loomer’s sensational display of outrage. Be angry at Twitter. Demand reformation. Keep your eyes peeled for competitors, and your wallets open to them. In fact, one free-market solution Trump could employ would be to personally leave Twitter and switch to a competitor like Gab. But petitioning for the government to seize more regulatory power over social media companies is a bad idea. Deep down, most of you know better. The government doesn’t solve problems; it creates them. Don’t succumb to the tempting promise of a cheap and easy fix in the moment. If you do, I guarantee you’ll regret it. Originally published at unsafespace.co on November 30, 2018.